Chip tuning Chevrolet Evada 2.0 VCDI 150 hp. 14 maps, an ultra bright display and specific software. Easy to install and use! The DrakeBox Monza chip tuning was designed to exalt to maximum the dynamic qualities of your car. This is possible thanks to an intelligent management of the injection parameters that allows a more effective and efficient combustion. The benefits are numerous and immediate. More than 40% of power and torque for your engine and less than 20% of fuel consumption in everyday driving. Surveys clearly superior to a professional remapping. 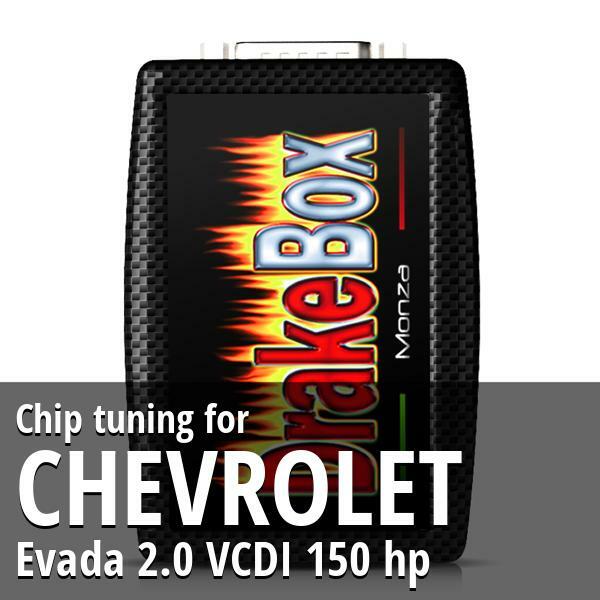 Your car will definitely show transformed thanks to the DrakeBox Monza chip tuning. Already more powerful engine at low revs with a constant boost up to the rpm limiter. The increase of power and torque is distributed throughout the period of use of the engine, ensures dispensing more fluid and frees from rip. All with significant improvements in acceleration from standstill, recovery when overtaking and max speed at the end of the straights. More than 40% power for burning accelerations at the start and an higher speed down the straight. More than 40% of torque with greater recovery and driving flexibility for an easier and faster overtaking than ever before. More efficiency with a fuel consumption of 20% less for traveling calm and relaxed. DrakeBox Monza gives you everything you need. DrakeBox Monza chip tuning has 14 different mappings. Each of these curves determines the mode of action of the chip tuning in relation to the accelerator pressure. This way you can completely customize the delivery curve of the engine and improve to the maximum your driving experience. You can use any mapping on your car and every configuration option appears on the new ultra bright display. DrakeBox Monza chip tuning also has a very useful regulator that allows you to modulate the levels of power and torque. With this device you have full control on the incredible potential of the chip tuning. The data processing is carried out entirely in digital and entrusted to a powerful processor of last generation. The internal software developed specifically for your car ensures a perfect synergy between chip tuning and engine. Even 14 powerful mappings and a new ultra bright display. Digital technology and a fast processor of last generation. DrakeBox Monza has everything that has made outstanding DrakeBox2, and much more. Including a special software for your car completely updated. All in an exclusive carbon design. DrakeBox Monza chip tuning has been designed to ensure total safety of your car. Safe- Engine is an innovative system which ensures maximum engine protection for your engine in any condition of use of the chip tuning. The engine is completely safe while maintaining the same durability and reliability as the original. DrakeBox Monza works in synergy with all car's systems, including the automatic transmission and particulate filter DPF (where presents). Installation is very simple thanks to the original connectors Plug & Play and the verification led prevents any installation error. The dealer's warranty is preserved and the device is completely invisible to the diagnosis of the workshops. Moreover, the chip tuning can be removed at any time without leaving any trace of the previous presence. Careful checks and Made in Italy certification makes DrakeBox Monza a top quality product. Engine's protection active system for maximum driving safety. Full compatibility with all electrical and mechanical systems of your car. Plug & Play connectors for quick and easy installation. Constant and accurate control of the product to ensure high standards of quality. DrakeBox Monza has all the security you need. Control your Chip Tuning with your smartphone in a simple, fast and safe way via Bluetooth. You can buy it alone and you can plug it directly to your DrakeBox Monza or your DrakeBox2. Wireless remote for DrakeBox Monza. You can check your DrakeBox with maximum comfort. Only be purchased together with a DrakeBox Monza . Not sold separately or at a later time. This Tuning Box is really amazing!!! My car is running a lot smoother and has a Big Power Increase. Fuel economy is increased also. I must say, This chip by far out performs the guys who do remaps. I am more than pleased. No black smoke as we are guaranteed, excellent fuel consumption. Big THANKS for your Draketuning Power-Box! I am very glad to have this device very quickly! This fantastic device has given me more impressions of driving of my SY Actyon! Great addition to the car, instant response and better on fuel, even the Wife is impressed!! Easy to install and works great! MPG is greatly increased in eco mode and the sport modes are a lot of fun. This is a great box I use them for better economy I've had 4 different car with a tuning box fitted and made them a better and drivable car . Great keep up the good work.